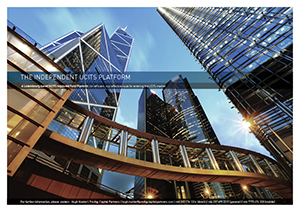 Independent UCITS has quickly become a leading provider of platform services in Luxembourg since it was established in September 2012. The Platform has achieved a critical mass of five funds and assets over US$120m. A further five new funds will be launched in 1H 2014 and there is a pipeline of new funds to be launched later in the year. Managers have freedom to brand each fund and class of shares independently of the Platform*.